Sunday was our half Anniversary. What’s a half anniversary I hear you ask? Well Hana and I celebrated our first anniversary after we had been going out for 6 months . It was a really nice milestone to mark and since then we have carried on celebrating each six months, our half anniversary. This year (or 6 months) Hana cooked us a wonderful meal and dessert. It was a very romantic and indulgent meal. I think it works well for special occasions, just like and anniversary or Valentines day. But be warned, it is very rich and creamy and so side side-splittingly filling that you’ll want to have a nap after it. We ate it in two goes as there was sooo much, finishing with the dessert and a glass of the wine before bed. By virtue of going to the supermarket (which I really love doing) I often find myself deciding what we will have for dinner. I don’t mind doing this but it is sometimes nice to have someone else decide for you. With that in mind I asked Hana to chose what she would like for our anniversary dinner and she came up with a sumptuous, gorgeous and indulgent feast. Spaghetti Alla Carbonara followed by Passion Fruit Jellies with a Syllabub Topping, yum! This is seriously filling food but it is perfect for a special night. The quantities will make enough for a big dinner and a midnight feast for two hungry people and as its so moreish I defiantly say make this amount! The recipes for both the Carbonara and the Passion Fruit Jellies come from Hana’s copy of Feast, By Nigella Lawson. Hana made a change to the Jelly recipe which you can find in my next post. 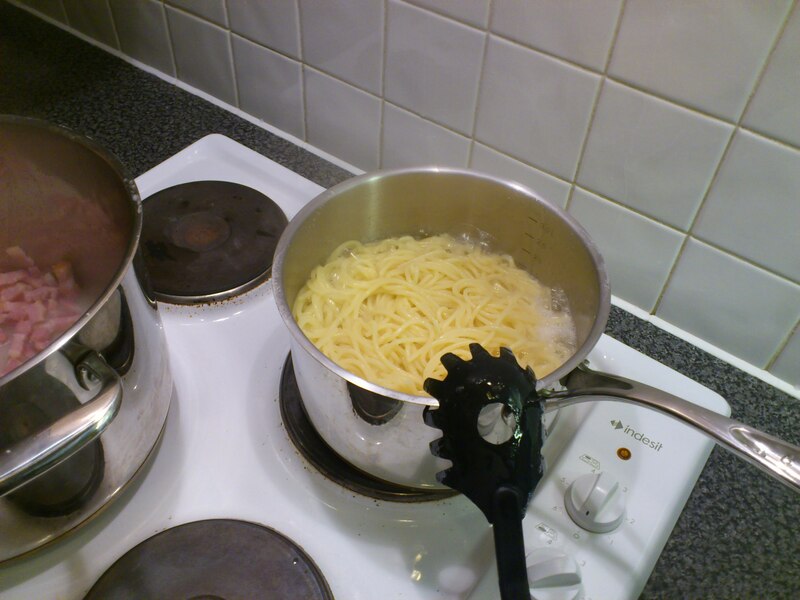 Pop on a pan of water to cook the Pasta. If using Pancetta cut into small cubes or Lardons. In a pan which will be big enough to hold the cooked Pasta and Sauce heat the Olive Oil and cook the Pancetta till just crispy. 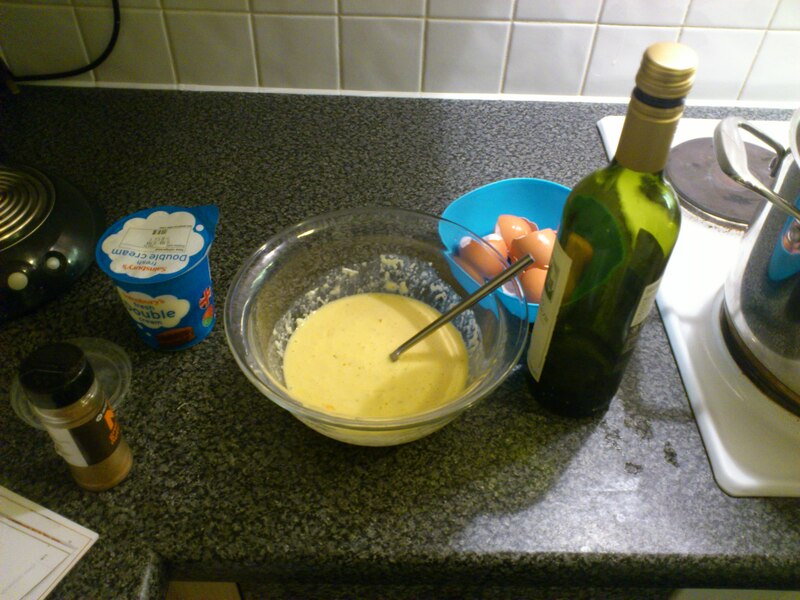 Add the White Wine and let it reduce to a rich salty, winey syrup. Remove from the heat and prepare the sauce. 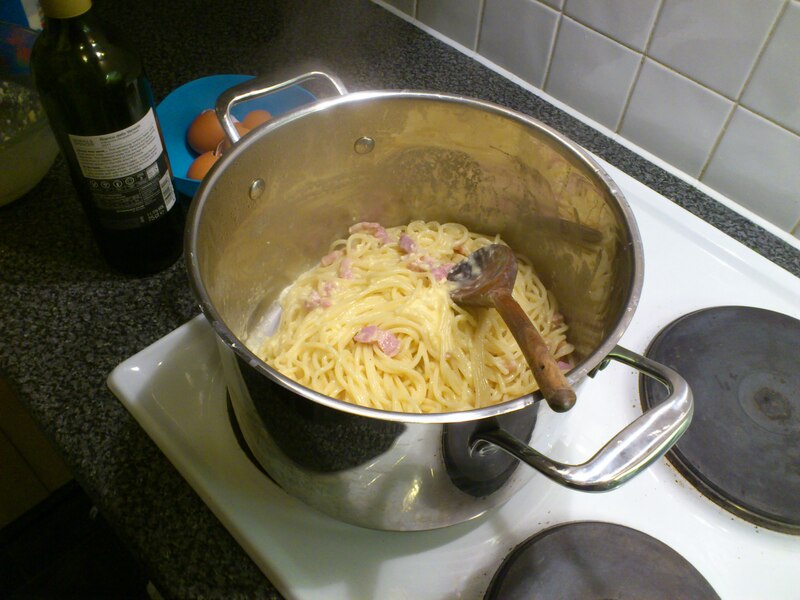 Beat the Eggs with the Parmesan and Cream and pop the Spaghetti on to cook according to pack instructions (around 10-12minutes for dried Pasta). Reserve 125ml of the Pasta water in a jug before quickly washing under running water and draining the Pasta. This removes the starch so the final dish is not too stodgy. Return the Pancetta/Lardons to the heat and toss through the drained Pasta to coat in the liquid. If it is too dry add a little of the reserved Pasta water. Once warmed through remove from the heat and and add the Eggy, Cheesy mix. Toss the Spagheti through the Sauce and sprinkle the Nutmeg. Make sure its all mixed together and serve! You’ll need a little nap after this, maybe snuggled with the one you love!